We all have some cans of food in our pantry or refrigerator. Make sure you know these canned food shelf life, safety and storage tips so you always have quality food to serve your family. 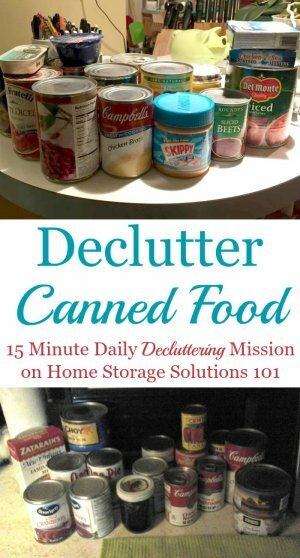 Today's declutter mission is to declutter canned food in your pantry or cupboards that is either too old to eat, or that you know your family will not eat, to get it out of there. 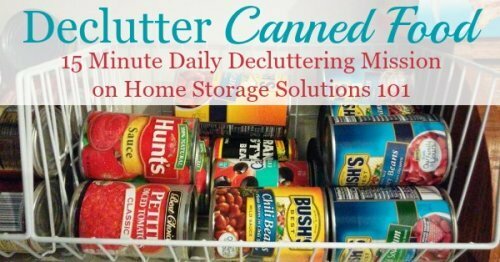 It is just one of several decluttering missions related to getting rid of food clutter within your kitchen and home, to help you organize your pantry or cupboards. I've singled out canned goods for their own 15 minute mission because, of all the food in your pantry, these items are the most likely to be the oldest, and some of them, like the one can that somehow got shoved into the back of the cupboard and forgotten, at this point probably needs to go. To declutter canned goods, as with any type of food, you always have three choices of how to declutter it -- eat it up, donate it to someone else to eat, or toss it. Ideally, to save yourself money you'll eat anything up that is getting older, but is still edible and safe to eat. That's what the Eat From The Pantry & Freezer Challenge that is running simultaneously with these food related challenges is all about. However, we all have made some mistakes when buying food, such as buying something we thought we or other family members would enjoy, but do not. If you are not realistically going to eat something it is better to remove it from your pantry and cupboards now, while it is still good for someone else to eat it, and donate the food to a food pantry or other charity. You can check out the linked article for ideas of items that food pantries really want and need to give you ideas of what to donate. But there are times when you just need to toss the food, because it is not good for you or anyone else to eat. To get a rough idea of how long items can stay in your pantry before they are too old to eat you can check out this free printable pantry food storage chart. In the chart it lists canned food, but I'll discuss the shelf life of canned goods below in more detail, since there are some special rules and information regarding them. 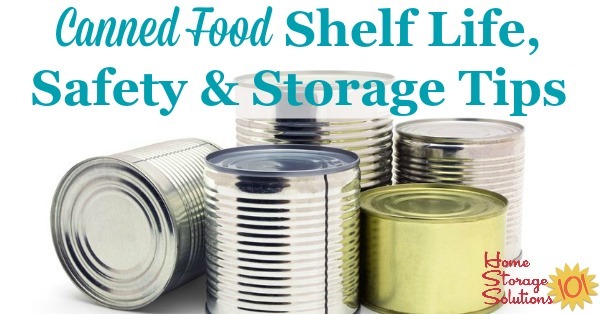 Canned Food Shelf Life & Whether This Type Of Food "Expires"
When you buy canned food, you're buying cooked food that is then had additional steps taken to stop the natural process of spoilage that then occurs, so you can eat the food much later. You'd never imagine buying fresh green beans and then trying to eat them, from your pantry, a year later. The beans would have spoiled long before. But that is exactly what you can do when you purchase a can of green beans. The shelf life of canned foods is approximately one year. While you can eat canned green beans a year later, and have them taste approximately the same as if you'd opened the can the day of purchase from the store, when you go much past that year long period there is a deterioration in food quality and perhaps in safety (more on the safety issue below). Because even with canned food there is a deterioration with significant periods of time many manufacturers will put an "expiration date" on canned goods. What I learned, however, is that the only item that federally must have an expiration date listed is formula, there are no standard guidelines in the United States for adding these dates to other types of foods, including canned foods. The result of this is that it gets pretty confusing when you are provided with a date on the can. It could mean the sell by date, the use by date, or the best if used by date. And sometimes cans don't have any date listed on them at all. There is nothing "magic" about the date listed on the can, such as the day before the date it is perfectly safe to eat the food within the can, but the day after the date it would kill you. Nope, it means nothing like that. Instead, it means gradually, over time, the food will begin to deteriorate in flavor or nutrition, and ideally you should have already eaten it by then. 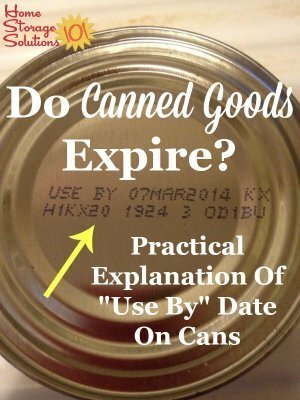 The further away it is from the date listed on the can, or the one year mark from purchase if you don't see such a date on the can, the better it is to just toss the food rather than try to eat it yourself or to donate it to someone else. All of the information provided above about canned food shelf life applies to unopened cans. Once you've opened a can of food you've exposed the contents to air and bacteria will again begin to grow and cause spoilage, like with any other food. Therefore, once a can is opened you don't have a year to use it anymore, but instead you only have a few days. And anything you don't eat immediately cannot be stored in the can any longer, but leftovers should be stored in an air tight container in your refrigerator, for approximately three days max (which is how long you food safety experts say you should keep any leftovers, at the max). Canned food is designed to be shelf stable and preserve food for long periods of time, but to have the canned food last as long as the expiration dates state it should you've got to practice proper storage techniques in your own home. When stocking up on canned food you know how easy it can be to have a can or two get shoved into the back of the pantry or cupboard and forgotten. This often leads to food waste because by the time you discover that can again it may have been several years if you don't do regular decluttering of your food storage areas. At that point it isn't ideal to eat those cans of food anymore. So, to avoid this problem, do a few proactive steps each time you restock cans of food in your pantry, as well as when you choose a can of food to eat as part of a meal. Follow the practice of can rotation, which is really a fancy way of saying, eat the oldest cans of food first, so you are less likely to ever worry about expiration dates again. Instead of placing new cans in the front of the pantry, where you're likely to grab then first, take a little more time and place them toward the back, behind the older cans, and then when grabbing a can for a recipe make sure you're grabbing the older cans up front. Or you can use a can rotation system, such as the FIFO Can Tracker shown to the right, to do something similar. Ideally you should store your canned foods in a cool (but not cold) dark location, such as within your pantry or cupboards. But what you really want is to avoid large temperature fluctations, and very hot storage areas, wherever you place your canned food. The reason is that freezing water expands, and can cause the contents of the can to swell, breaking the seal within the cans that keeps them airtight and bacteria from growing. Further, extremely hot temperatures can also cause bacterial growth more quickly and cause food spoilage as well. I know a lot of people keep excess canned goods out in the garage, for instance, but you need to consider whether that will be a good place to store your canned goods based on the temperature fluctuations you experience in this space. 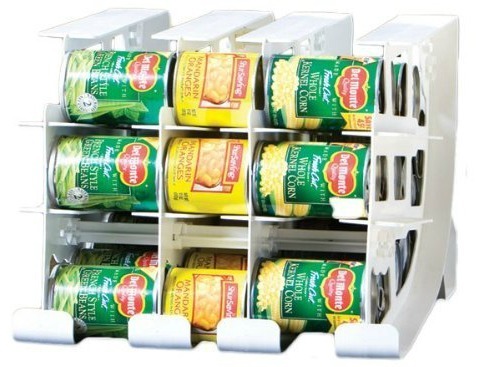 You can get lots of real life ideas for canned food storage here. Earlier in the article I explained how there is no magical date with a can of food where you can say with certainty it is not safe to eat, and that is true. However, there are tell tale signs of spoilage or breakage in canned goods which are clear warning signs for you to NOT eat that can of food. If one of your cans is leaking, rusty, or significantly dented you should not eat the food within it. Similarly, if the can is bulging or swolln this is also a tell-tale sign of spoilage and unsafe food. What that bulging represents is gas build up with the can which results from bacterial activity. Similarly, small dents in cans are not a big deal, but large dents, especially dents on the seam or rim should be avoided. The reason is that canned food is sealed to keep bacterial growth to a minimum, but dents to the seam or rim are very likely to break that seal, meaning the food inside may be beginning to harbor more bacterial growth, which is what causes spoilage and can make you sick. So no matter what the date is on any can if you see any of these problems with cans in your pantry or cupboard you need to declutter these cans immediately, and do so by throwing those directly into the trash or recycling. I hope this mission and information has inspired you to check out your pantry and cupboards for old or unwanted canned goods.